At height of the tablet revolution, once again the mysterious HP Slate appears, this time bringing some leaked info to the blogosphere. 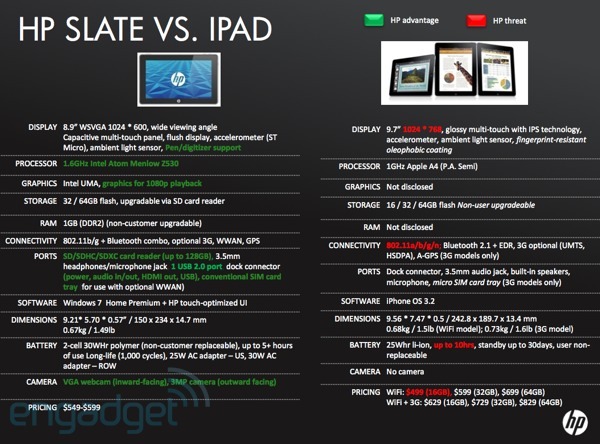 An apparent leaked internal document from HP show us what the iPad is up against. Just like the iPad, the Slate is really the only other tablet that has nearly as much hype surrounding it. The upcoming HP Slate looks promising. It’s a true laptop replacement running a Windows 7, so that means it will be running Adobe Flash just like any other full-featured netbook, laptop, or desktop. The HP Slate has a 8.9-inch 1024 x 600 capacitive multi-touch display, a 1.6GHz Atom Z530 processor with UMA graphics and an accelerator for 1080p video playback, 32GB of flash storage and 1GB of non-upgradeable RAM. Those specs apply to the baseline model that will cost $549. The Intel Atom Z530 processor will give the Slate about 5 hours of battery life. Which isn’t that bad, the iPad does offer about 10 hours, so Apple does have a leg up on that aspect. There will be a $599 version that has 64GB of storage, but both models will have SDHC slot, a USB post (which is huge), 2 cameras, HDMI output, and an optional 3G modem. The Slate will apparently be running WIndows 7 Home Premium, not the netbook friendly Windows 7 Starter. This does mean that multitasking won’t be a issue. Five hours of battery life is not enough, though you can’t expect more life with all them features.